Pad Thai is now one of the world's favorite noodle dishes and luckily it's easy to make at home with these delicious Pad Thai recipes. Choose from chicken Pad Thai to shrimp or vegetarian Pad Thai—they're all wonderful. 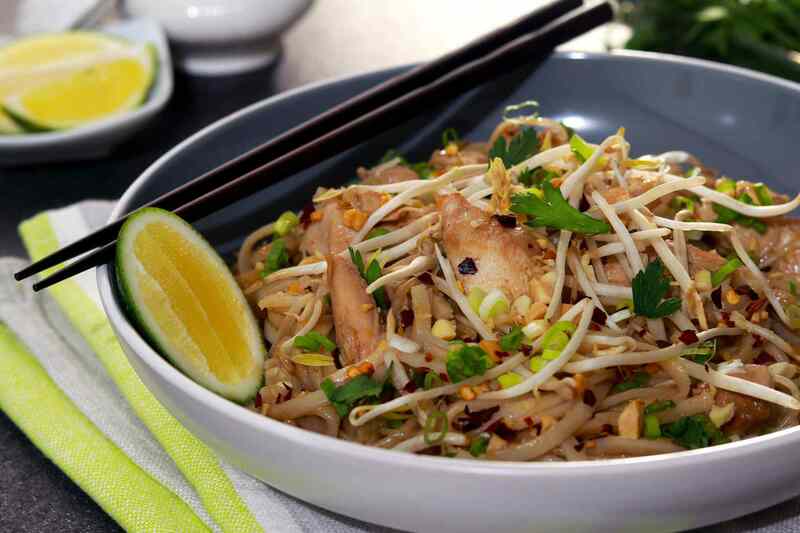 Here is a simple recipe for the world's best chicken Pad Thai. It's an authentic recipe from one in the know. Add more or less chile to adjust the heat and you're simply going to love it. Love Pad Thai but don't have all the ingredients? Then this recipe is for you! It's an authentic recipe from a Thai chef in southwestern Thailand. If you're living in a place where Asian ingredients are difficult to find, then this easy chicken Pad Thai tamarind-free recipe might just make your day. This scrumptious noodle recipe for Pad Thai Gai features stir-fried rice noodles with chicken in a tangy sauce along with toppings of chopped nuts and basil. You'll love the sweet-sour balance of flavors along with the comforting combination of chicken and noodles. You'll find that this quick-and-easy Pad Thai with shrimp recipe easier than traditional Pad Thai recipes and, yet, the taste is all there. Many of you are discovering that tamarind paste—a traditional ingredient in Pad Thai—is difficult to find. But originally Pad Thai was made without tamarind (it didn't become part of the standard recipe until much later)—lime juice was used instead. Try it and see how easy and delicious ​Pad Thai can be. This classic shrimp Pad Thai recipe is authentic, easy, and so scrumptious! It's based on pad traditional Thai dishes and those from some of the best Thai restaurants in North America. The sauce is simple to make, and the noodles come out tasting chewy-sticky and delicious. This easy Pad Thai with chicken and shrimp recipe is authentic and simple enough for any aspiring cook to make. The Pad Thai sauce is easier to create simply because there is no tamarind paste to mess with. Traditionally, Pad Thai was made just in this way, simply and wonderfully, so be sure to give it a try. This is an authentic gluten-free and vegan-friendly Pad Thai recipe for food lovers or for those who want a lighter noodle dish without the meat. This recipe does offer adequate protein in the form of eggs (vegans can omit this ingredient), and ground nuts. Plus, because it's made with rice noodles, Pad Thai is a gluten-free recipe. To get this dish just right, follow this easy step-by-step recipe for Pad Thai and find out what a cinch it is to make this restaurant-quality meal at home.